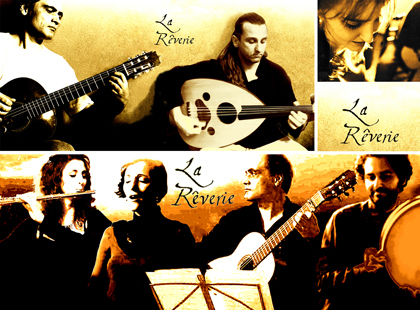 La Reverie: Recreating traditional music from a modern perspective. 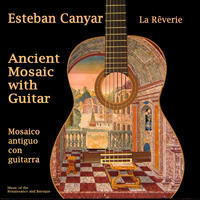 Esteban Canyar was born in Granada (Spain) in 1962, where he studied classic guitar, vihuela and renaissance and baroque lute. He learnt music theory at Open University and attended courses and master classes with prominent guitarists such as David Russel. 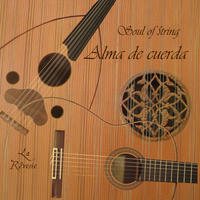 Among his most remarkable redorded albums are: Música antigua para un tiempo vacío (2002) featuring soprano Palmira Irisarri; El sombrero del alquimista (2009) with multi-instrumentist Ignacio Béjar, an album which was very well received by the critics and is regularly aired on the Spanish National Radio; and Alma de cuerda - Soul of String in (2010), by Magnatune, an album that is being widely heard worldwide through music platforms such as Spotify or iTunes. In March 2012, Manuel recorded live for the Spanish TV (RTVE) in a remarkable scenario: aboard the Goleta Sadko, a schooner anchored at Puerto de Santa Maria (Cadix, Spain). He has performed in a great number of venues, such as: Sala Gades at the renowned Teatro Cervantes in Malaga (May 2007); Salvador Dalí's birthplace, as part of the Cadaques International Music Festival (August 2007); Arab baths in Ronda, Malaga (June, 2008); at the closing concert for the I World Music Festival at Malaga University (May, 2009); Bil-bil Castle in Benalmadena, Malaga, as part of the Music for the Soul Festival (September 2012); and at the Salón de los Espejos in Malaga's Town Hall (June, 2014). Juan Manuel Rubio is a multi-instrumentalist essentially of self-taught orientation, born in Jerez de la Frontera (Cádiz) on May 30th, 1972, a waning moon night. His interest in ancient, ethnic and traditional music has led him to progress in an endless pilgrimage through different musical instruments such as Rabel, Hurdy-gurdy and other instruments from the Iberian Peninsula tradition, or the Crwth Harp from the Welsh bardic tradition. A more recent exciting discovery is Arabic, Turkish and Persian music under such illustrious teachers as Amin Chaachoo (Tetuan), and Oruç Guvenc and Necati Çelik (Istanbul) with whom he excels in the interpretation of the Oud. In Istanbul he also began his training as an interpreter of Turkish Santur, Qanun Baglama and Saz with outstanding teachers such as Suhat Baktagir, Tarik Aydoglu and Osman Aksu. 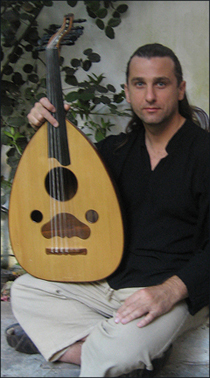 This ongoing training has today led him to specialize in the interpretation and study of these and other instruments such as Rebec, Fiddle, Kemanja, Qanun, and Lute. 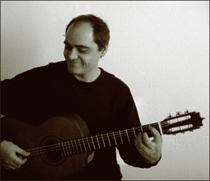 Since 1999 he has participated and collaborated in different ensembles specializing in the interpretation of Early, Traditional and Eastern and Mediterranean music such as Ã§brigu, Bran Ruz, Alquimia, Arte Factvm, Caravasar, Estambul, El Sombrero del Alquimista, Capella de Ministrers, L'ham de Foc, Ross Daly, Samarcanda, Mediterranea, Zejel, Durendal Ensemble, Capilla de Música Antigua de Chinchilla, Estampida Real, Yasmine Levy, Dufay Collective, Estampie, Tétouan Conservatory Orchestra and Schola Gregoriana Hispana. Yolanda Campos was born in Cádiz (Spain) in 1977, she started her music career at Orense's Conservatory of Music where, in 1991, she discovered one of her biggest passions: singing. Besides her music studies (music theory, singing and piano) in the north of Spain, she graduated in translation and interpreting from the University of Granada in 2000 and speaks seven different languages. Yolanda has sung in quartets, octets and choirs with conductors such as Francisco Ruiz, Pablo Heras, Josep Pons and Harry Christophers. Among her noteworthy concerts are: the recording of José García Román's Stabat Mater for the Spanish national radio (Granada, 1995); Mozart's Magic Flute at Granada's renowned International Festival of Music and Dance (2000); cooperations with La Danserye in the Ecos del Templo y de la Corte (Echos of Temples and Courts) series of concerts around Andalusia (2006); or being in charge of the closing performance as a soloist at UNESCO's conference on Education for the Third Millenium (Malaga, March 2013). A highly versatile and expressive artist, she loves all music styles and has also worked as one of the main characters in Romeo and Juliet: the Musical for two years. She has taught music and dance for 5 years in different international schools in Thailand to students between 3 and 16 years of age. She has also organised numerous music events both in Thailand and Spain, some of which have helped her raise money for charity institutions. She is currently involved in diverse music projects and works as a teacher training organiser at the Teachers' Centre in Malaga. She lives in Malaga with her husband and two children. Inmaculada Gómez Díaz was born in Malaga in 1985. 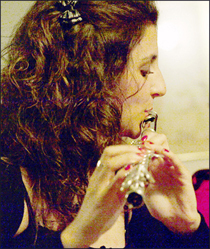 She graduated in Transverse Flute from Malaga's Higher Conservatory of Music and has completed a great number of flute-based courses with prestigious professors such as Salvador Espasa, Fried Dähn, Bárbara Rostnitschek, Gabriel Ahumada, Wendela Clarie and Paul Arhz. Some of her most relevant performances have taken place in her hometown: with the Symphonic Orchestra of Malaga's Higher Conservatory of Music conducted by Octavio Calleya at Seville's Cristóbal de Morales Professional Conservatory of Music in 2007; at the Young Interpreters Festival in Malaga's María Cristina Conservatory and as Main Flute in the municipal bands of Mijas and Antequera; and with Banda Trinidad Sinfónica at Malaga's Alameda Theatre. Despite her youth, she is involved in an intense teaching activity. She has taught members of Zamarrilla and Trinidad Sinfónica Bands and she currently teaches Transverse Flute, Piano and Musical Language at three different Music Schools: Coín's School of Music, Alhaurín de la Torre's Municipal School of Music and Torremolinos' Albergue de la Música - where she also teaches music to disabled children. She is currently studying a Music Teaching Degree in Primary Education. Ángel Martín Bandera was born in Málaga in 1976. His interest for music started at a very early age although he would begin his formal music studies after obtaining his bachelor's degree in engineering. He began studying traverse flute in 1998. However, his passion for music from "other worlds" constituted an awakening initially characterized by a deep interest in African percussion, which lead him to an investigation experience in Burkina Faso in 2000. One year later, he worked for an NGO as a social facilitator and educator in Bolivia, where he studied two Andean instruments: the quena and the siku. In 2002, during a three-year period living in Italy, Ángel combined his flute studies in Arrigo Boito Conservatory of Music in Parma with the deep research on wind and percussion instruments present in cultures all around the world. Back to Málaga in 2005, his flute studies continued with Keiko Takehuchi and he began his autodidactic studies on frame drums (mainly riq and tar). 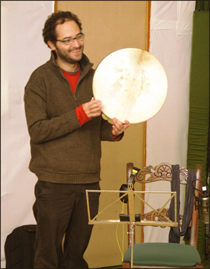 Since then, he has attended several workshops on frame drums and has continued his research on this type of percussion. One of his most renowned teachers has been Ricardo Passos. Ángel has worked as a therapist and facilitator for different projects and associations in Málaga (Spain), La Paz (Bolivia) and Cremona and Parma (Italy). As a flutist and percussionist he has worked and performed with bands of various music styles (rock, folk, traditional music) such as: Khairkan, El Sombrero del Alquimista, Userne or Mokambo, with whom he has performed in Spain, Italy and Latin America. You can find out more about La Rêverie on their 크레이지슬롯 사이트website. La Reverie lives in Granada, Spain. 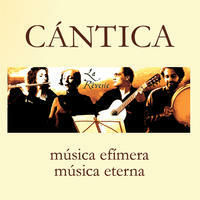 Tagged as: Classical, Renaissance, Baroque, Classical Singing, Composer: Esaias Reusner, Composer: Esteban Canyar, Composer: Johann Sebastian Bach, Composer: John Dowland, Composer: Ludovico Roncalli, Composer: Luis de Milan, Composer: Luis de Narvaez, Classical Guitar.